Unique custom finishes make this corner lot mid-town home stellar. Blue canvas awnings are a bright touch. The original part of the home features a kitchen that opens to a patio, 2 bedrooms, a small inside dining area and a full bath. A connecting tiled foyer & short stairway opens onto a large living room, T & G walls, vaulted ceiling, recessed lighting bamboo floors & full bath w./ cork flooring. A doorway leads to a raised deck under a mature canopy of trees. Master bedroom/bath/shower/cedar walk in closet is on 3rd floor which also has high ceiling & covered balcony under the tree tops. Brick pathways, pavers, off street parking behind fence completes this tropical home. Accessed extra parking on Easement also available. 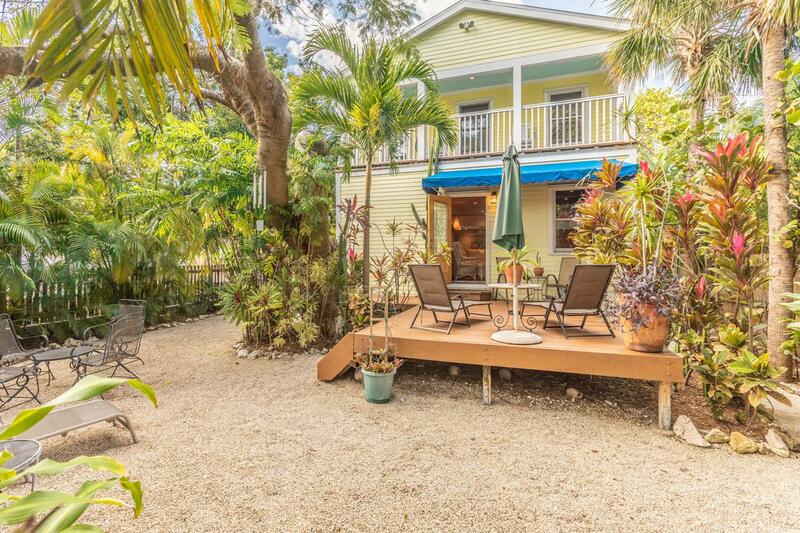 Listing courtesy of Andrea R Weitz of Century 21 Schwartz Realty- Keywest.